Many people are using Skype for fun and video calls only, without knowing that there are several things to do with Skype, the same way you can be able to make money through Facebook, you can also make higher money on your Skype, by using it for business promotion and presentation as well. 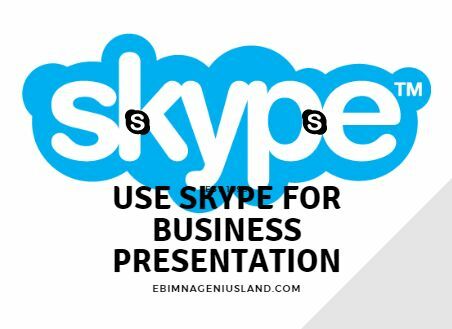 Using Skype For Business Presentation is one of the benefits of Skype, not just for video chatting your loved ones. Speaking in public is panicking and nervous for a lot of people and in order to make it in business when you can't speak in the public especially when you want to advertise your business, all you need to do is to learn to do your presentation online. Now, take a gradual look at some simple ways to make your business move higher using Skype or using Skype For Business Presentation. It's proper to have skype account although you might think that it's all about fun, you need to know that there are several benefits of having fun on skype. on that your Skype account, make sure that your profile photo is a great and attractive one for that moment. 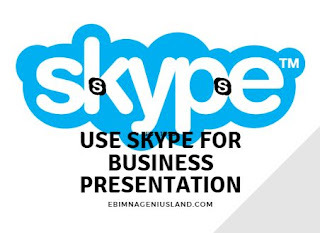 This is another safe and best method of using Skype for business presentation. Make the conference call one that is motivative and also inspirational which will help your group members grow their business and also make it interactive to the extent they can ask you questions while you as well give them answers that are very right and direct. It keeps them wanting to hear from you every day. When you are privately on your own, if there are some tutorials that may help enhance the business of your participants, all you have to do is record your presentation sometimes, and make sure you make it look very real and original in a way that they will have o believe each and every word and tutors of your especially when there are proofs,. This is one of the most important ways of promoting your business on Skype, especially when you are good project manager. you are expected to manage your participants positively in a way that they will even be the pones advertising your business for you, even when it is unknown to them. You must have always remembered that customers are always the number people to put in consideration first before any other thing when you don't put your customers first, and their progress first, you will miss it all. Therefore, you must devise a tactic to manage your participants properly in a matured way, with a genuine mind. Don't ever speak in parables to your audience because they will always want you to hit straight to the point. Make sure that what they want is what you give to them, and then with that, you will always have to keep winning their heart, while they keep winning others for you. I have tried to make money in so many ways, but I have not tried Skype. I'll give it a trial.